Stuart Varney: A guest for us now, Jack Nicklaus, a golfing legend himself. Mr. Nicklaus, welcome to the program. Good to hear from you, sir. Jack Nicklaus: Hey, Stuart. How are you doing? Stuart Varney: We’ve been talking all morning about what a great golfer Arnold Palmer was. But I want you to tell us what kind of a person he was. Greg Norman has already said he was a wonderful man and a wonderful sportsman. What was your impression? 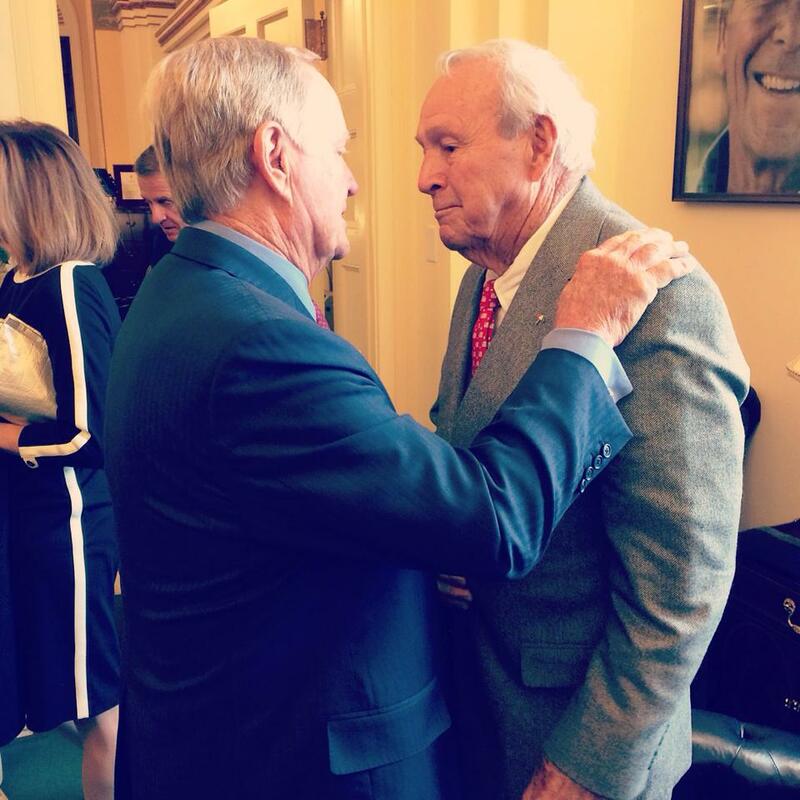 Jack Nicklaus: Well, Arnold was a great friend. He was a great friend to the game of golf. He was a great friend to the sporting world. He liked to do things the right way. He was sort of the one who popularized the game of golf from the fans’ standpoint on television. He had his army and he loved people. He loved being around people and he loved being there to lead them. He was a great competitor. He and I had a great rivalry that lasted from 1962 until yesterday. Stuart Varney: That rivalry put golf in front of a huge population. That rivalry on television made golf democratized, didn’t it? That’s my opinion. Jack Nicklaus: Well, it was fantastic. We enjoyed it. I mean, I think Arnold and I spent more time trying to beat each other than we did trying to beat the field. And, that was alright. I’d shoot 74 and he’d shoot 75 and I’d say, “Well, I got you today!” Of course, the whole field passed us, but that didn’t make any difference to the two of us. We were too interested in beating each other and we had a lot of fun doing it. Stuart Varney: He was the man who essentially put the money into golf. Is that right? Jack Nicklaus: I think so. I think he was the one who kick-started it. He just sort of propelled it by himself from a television standpoint and so forth. He did a great job, and he was just a great guy. I talked to him two weeks ago and he was still encouraged about his golf game. He said, “I’m getting back to hitting some golf balls again and starting to have some fun.” Then, all of a sudden, I guess he was in the hospital and he just didn’t make it. Stuart Varney: Yeah, it’s a sad loss, but a wonderful man who contributed mightily to the great sport of golf. That’s how I’d sum it up. Last word to you, sir. Jack Nicklaus: Well, I think you’re absolutely right, Stuart. He was the king of the game and always will be. We all owe him a lot in the game of golf, and I think a lot of people can learn an awful lot from Arnold Palmer. Stuart Varney: Yes, indeed. Jack Nicklaus, a pleasure sure. Thank you very much for being on the show today. Jack Nicklaus: Okay, Stuart. Nice to talk to you again. Stuart Varney: Arnold Palmer died at the age of 87. He had won seven majors, 64 PGA titles, and as I said to Mr. Nicklaus there, he essentially put the money into golf. As a young lad in England in the 1950s, I remember hearing about Arnold Palmer who had got a million dollar contract with Pennzoil. That fired me up.